Did you hear that the new iPhone 7 won't have an analog headphone jack? Yeah, I know, everyone heard. It was literally breaking news, yesterday, on CNN. But concerns only began with CNN. Within hours, I was pinged by friends and colleagues, "Joe, what are your thoughts on this whole earphone jack thing with Apple?" 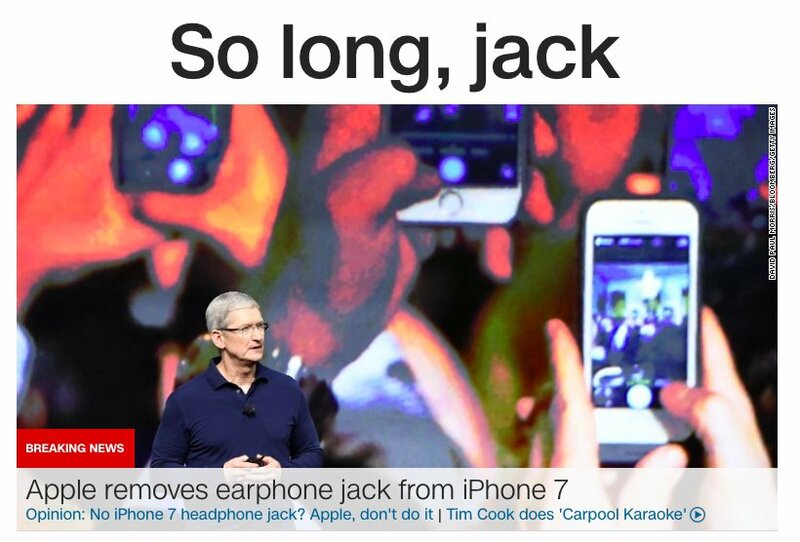 I'm surprised that Apple brought so much attention to the fact that the analog jack was going away. I don't recall Steve Jobs making any mention about the fact that Apple got rid of the floppy drive on the original iMac in 1998. Back then, Apple was earning less than $50M/quarter with less than $5B in market capitalization. So a radical departure, like the elimination of a floppy drive, was a boom or bust move. 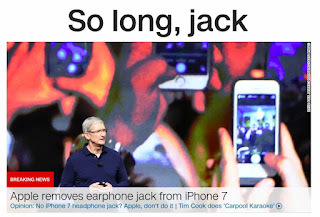 The reason people are asking about the lack of a jack on the new iPhone 7 is because they're not sure what it means, in the future. They don't know, so they ask, which is an ideal way to form an opinion. Apple has always been great about transitioning from an old, outdated technology to a new one. That was the case with the transition from OS 9 to Mac OS X by cabonizing apps (all life is based on carbon) and with the transition from PPC to Intel processor (Marklar) seamlessly using Rosetta. But, the key part of Apple's transition away from the old analog jack to a Lightning connector is similar to the move from a 30 pin iPod connector to Lightning in that its more efficient as it saves space. So, what's an iPhone owner need to do with their traditional earphones when they get an iPhone 7? Nothing. They don't need to purchase anything else since the iPhone 7 ships with an earphone to Lightning adaptor. There's not much to see here, other than progress, innovation, and, as Phil Schiller – who gave a spectacular presentation, yesterday – put it, "Courage." What does this image represent? Last month, Apple sent out an invite for yesterday's iPhone 7 announcement. I spent a bit of time looking at the blurred image of lights in the distance, speculating on what it meant. Were those traffic lights, street lights, and break lights? Perhaps. But why? I saw some speculation on the Internet, but it wasn't until the very end of yesterday's Keynote when I figured out what the image represented. 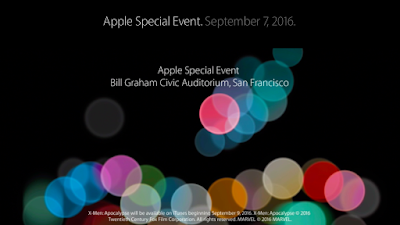 Apple concluded the Keynote with the image below; a slightly cropped image of the original and it became apparent. 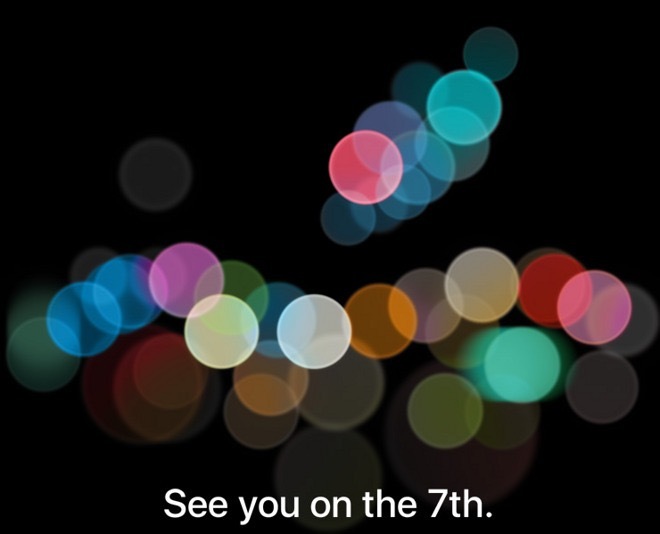 This image was nothing more than blurred lights making up the top part of the Apple logo. I don't know if there was any intentional meaning behind these images, but I can speculate that, before the Keynote, things were "blurry" and after, everything became clearer (hat tip to a better iPhone camera). Like the hidden arrow inside the FedEx logo, once you see the Apple logo, you can't "unsee" it. Of course, the question going through your head at this point is why did I spend so much time over-analyzing this image? Great question. The short answer is because I have too much time on my hands. The long answer is, since I get paid to speak about Apple, I want to understand as much as I can. But, alas, I was too slow in figuring all of this out as others had figured it out, last month. It's all very clear, now: The blurred top of the Apple logo.